The secret of the stability is the the square tube steel and additionally reinforced by beads curves. With normal force can the fretsaw not bend or squeeze. Shape and stiffness are maintained over the years. Generations of professionals, students, and hobbyists have struggled to get the right tension to the saw blade. With the Hegner Fretsaw LS 250, the clamping system does all the work. Hegner has thought of everything. The saw blade can not survive because it is in a blind hole. A source of danger for eye injuries is eliminated forever. Safety also be rigidly mounted handle and fine mechanical clamping system. 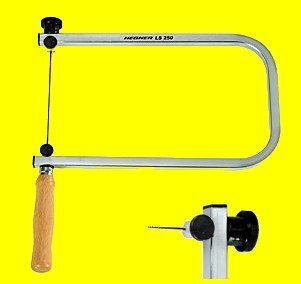 The Hegner hand fretsaw LS 250 is for schools, sheltered workshop, modeling, jewelery, crafts, fine arts, toys and furniture manufacturing, handicrafts. Identical to the LS300, but smaller and perfect for kids.